The moment you write the current year, Word will give you the date. You can ignore this suggestion altogether. Open the menu command “Tools | AutoCorrect Options” to change this mode. 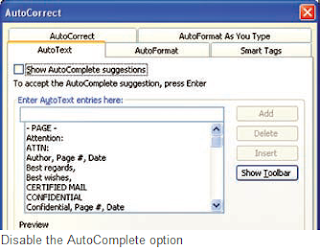 Open the tab “Auto Text” in the next dialog and disable the option “Show AutoComplete Suggestions”. Confirm using “OK”. In any case, 2003 onwards Word has done away with the AutoText option for Suggestions of AutoComplete.